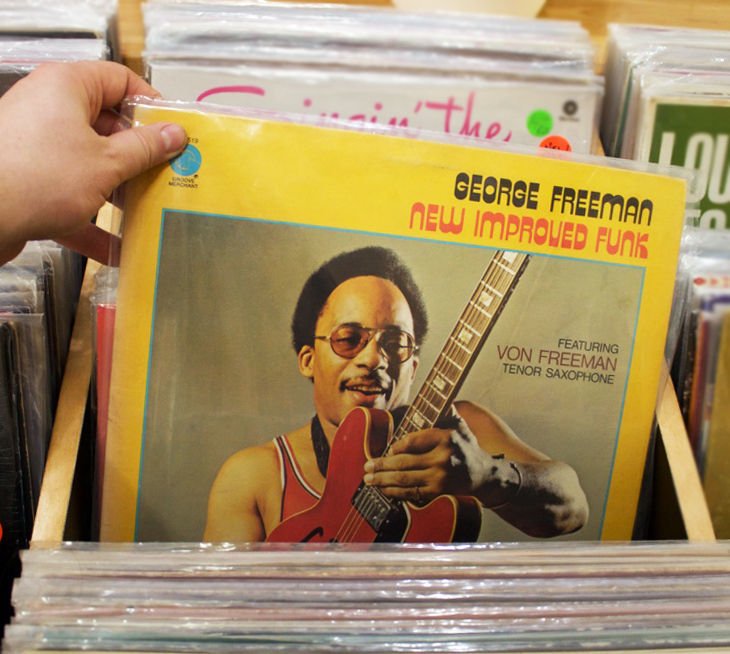 Dorian’s Through the Record shop is proud to present one of Chicago’s elder statesmen and illustrious Jazz luminary George Freeman on Saturday, April 27. Still ever-youthful at 92 (George just celebrated his birthday on April 10), George keeps playing around town and still practices his distinctive guitar style daily besides releasing new material. His quite recent 2019 Southport Records release “The Bomb!” (April 2019) finds George in great form showcasing new material that traces his roots back to the blues, with special guest and three time Grammy nominee Billy Branch on harp and vocals. He is one of the few remaining living musicians who recorded with Charlie Parker (“An Evening In Chicago” Savoy, 1950) besides being a member of a sextet led by jazz legends Johnny Griffin and Joe Morris. In the mid-1950s, George started a long association with organist Richard “Groove” Holmes, appearing as sideman and song contributor on Holmes’ World Pacific and Prestige. After touring with Gene Ammons and Shirley Scott, Freeman decided against any more road work and has been based in Chicago. Many of George’s solo records are sought after treasures by crate diggin’ collectors and DJs worldwide. His track “The Bump” (released on Franticdiagnosis Records in 1972) has been sampled by The Wiseguys with the original LP fetching over $150 today. The track was later re-released on Ubiquity Records’ “Can’t Get Enough” collection. He is the brother of late and great tenor saxophonist Von Freeman and drummer Eldridge “Bruz” Freeman and the uncle of saxophonist Chico Freeman. George and Von collaborated frequently throughout their careers. Other musicians he has worked with include Ben Webster, Illinois Jacquet, Sonny Stitt, Sonny Criss, Charles Earland, Jimmy McGriff, Les McCann, Eldee Young, Harold Mabern, Kenny Barron, Bob Cranshaw, Buddy Williams, Kurt Elling, Red Holloway, Corey Wilkes, Ernest Dawkins, Mike Allemana and the Deep Blue Organ Trio. George will be joined by Vince Willis (keyboards), Kevin Patrick (drums), Jack Zara (bass) and Lorna Boston on vocals.